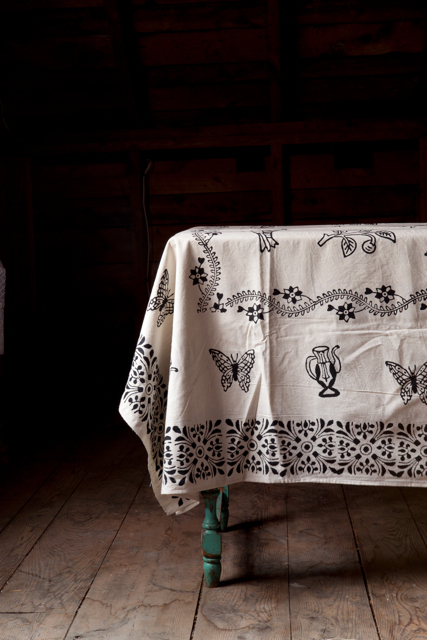 If you’ll recall, these table cloths are handmade by a Syrian family who actually carve their own wooden printing blocks and mix the dye for these cloths from Walnut Shell and Pomegranate Skin, creating beautiful, one-of-a-kind pieces. How cool is that!? Okay, so fast forward to a super fun barn party hosted by one of my “besties” and a friend of a friend starts chit chatting about life and before the night is over, I’m heading to her house to check out her kitchen. That night, she described her house (renovated cottage- style Cape), her likes (color, unique, old woods, vintage with a contemporary twist), and she made it clear that she REALLY wanted a unique fabric for her windows. Yes! You guessed it! I brought these table cloths over and within minutes, we decided that these would become her window treatments! Now the challenge is to find two that are similar. Our plan is to make two roman shades, with medallions featured down the center of the fabric (not shown in photo), and then a straight, no frills cornice for over the sink, paired with simple, off-white designer roller shades to provide privacy at night. Here’s a before shot. The walls read purple in this photo, but they are really a happy shade of blue. The counter tops are black granite as are the hardware and cabinet kick plates. The vintage metal chairs around the old english pine table pull features from the adjoining family room, which has white wainscoting 3/4 of the way up the wall and then red walls on top. The walls are decorated with super cool, vintage posters that are framed in black, which are not only fun to check out, but lead the eye back to their beautiful stone fireplace. As for the kitchen, we’ll be moving some of the wall art around so that her kitchen isn’t too busy and offers a hip yet sophisticated style. Thankfully, most people’s senses are on high alert when it comes to caring and preserving Mother Earth. This plays out in so many respects, including today’s home design trends. The use of reclaimed products in the construction of homes, as well as home accessories, continues and I have to say, I LOVE it! From casual and fun to traditional or contemporary, the use of old barn board and exposed beams certainly brings added texture and natural warmth to a home. Who wouldn’t want to lounge around in this room? Traditional, rustic yet slightly glam = interesting and very cool. The wood really transforms this cold space into a home.